Networks are central to a science of cities, and in spatial analysis, space syntax which is a way of measuring accessibility between streets – where streets are treated as integral parts of the city – as spaces almost – is one of the key developments. Here we take the method forward by developing a Windows-based program for generalised space syntax. It enables users to perform traditional space syntax, called the primal analysis, which consists in describing a spatial configuration as a set of axial lines, usually lines of uninterrupted movement along streets in cities, and working out their relative proximities, accessibilities or integration values. 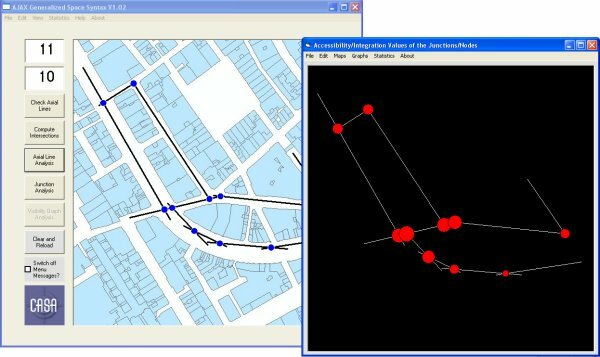 But the program also enables users to generate the dual analysis, which consists in working out these same accessibilities with respect to the intersections between the lines that we call junctions or nodes. You can download the current version from this page. by clicking on the icon here. We are not supporting the program in any way as it is free and not under any active development. The program is quite user friendly but there is no help. We have put up a pdf file left that you can download with an example of how to use it – this is for the previous version and the current versions v1.02 has more functionality – but we hope it is self-explanatory. I would like any users of this version to email me if there are any unwitting crashes and of course suggestions are welcome. For previous versions, we have encountered an error for some versions of Windows and if you get an error message asking for some missing .ocx component, then the way to remedy this is search Google and download the patch. In the current version, we hope this has been resolved as we are no longer using APIs. The program essentially lets you input your own map and then draw axial lines on it so that the analysis can be generated. You can save data from the program and save the maps you generate. You can adjust your map to the screen size by zooming and this means you can use it on most PCs. Here is an example from the screen you get it you load the tool. It is a map of Regent Street in London which you can experiment on. The program is restricted to 500 axial lines but it would take several minutes to process a problem this size. Problems with less than 100 lines and/or nodes are very fast. It was first developed in 2004-5 and you can tell from the media and logos here that it is a past project. But still useful we think. I talked about this software and the logics behind it at the Fifth International Space Syntax Symposium in Delft 13-17 June in my invited speech. I have also talked about it at SAGEO 05 in Avignon and in Pisa to spatial analyst groups. The ideas are based on my working paper in 2004 “A New Theory of Space Syntax” which is on the CASA website under publications.